A. Bleaching agent in the food industry: Such as maintaining the oxygen in the vegetable dehydration; bleaching and maintaining the freshness of stored fruits like plum, orange, mango, olive, tremella fuciformis, dried bamboo shoots, sweet potato, peanut, mushroom, etc. B. Preservatives: Anticorrosion and sterilizing in the production of glazed fruit, canned food, beer and beverages. C. Osteoporosis agent: Reducing the toughness of gluten and making cookies crisp. 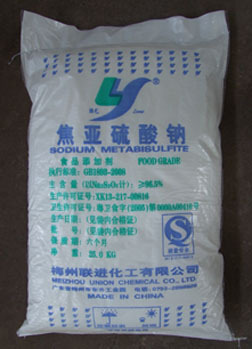 Used as a mordant dyeing,fabric antichlor after bleaching,paper fiber bleaching agents,chemical medicine by reducing agent and sulfonating agent,non-ferrous metal ore-dressing agent,waste water treatment agent,tanning agent for leather industries,natural rubber coagulant,additiver for building materials.